You did quite well, but you need more training to defeat me! 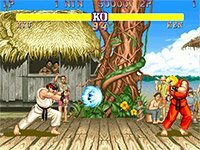 There's no doubt that Streetfighter 2 (in its various incarnations) is one of the biggest games ever to hit the arcades. It's free-flowing gameplay, six-button attack configuration easy to learn, but hard to master combos and of course cheesy victory / defeat catchphrases all contributed to its phenomenal success. So much so that SF2 was the biggest arcade hit of the 1990s - and that's saying something. These days dedicated SF2 cabinets are extremely rare (especially as many cabinets back in the 90s were generic JAMMA cabinets). But don't worry - SF2 lives on in arcade form in one of our many multi-game arcade cabinets, where not only do you get to play many of the Street Fighter variants from throughout the years, but also hundreds of other games - YOU WIN! Ryu just turned 50. Yup, according to his birth certificate in the game (born July 20th, 1964), everyone’s favourite master of the Shoryuken is getting up there in years, which is strange, because many people remember playing Street Fighter 2 at the arcade like it was yesterday. This sense of timelessness shows you how much of an impact this game has had on those who were lucky enough to get on the sticks and enjoy SF2 in its heyday. Released in 1991, this second entry in the brawler series proved the Empire Strikes Back theory by creating an experience that exceeded the original in terms of quality and substance. Some of the biggest improvements included the use of command-based special moves and a six-button configuration, allowing for the unprecedented ability to customise the way players approached the game in terms of fighter strategy and style. In this colourful brawler, you take the role of a globe-trotting martial arts master looking to prove his or her mettle by taking on fights in exotic locales across the world. The jungles of South America, Dojo’s of Japan and underground fight clubs in Spain are just some of the places where you must enter combat against a similarly skilled combatant and throw down using some of the most nuanced and polished fight mechanics ever seen up to that point. While the complex, yet streamlined button configuration was the plan from day one, the ability to perform combination attacks only took shape late in development. In what can be deemed the "Creeper Effect" (in honour of Minecraft and the accidental creation of the most famous baddie in the game) Street Fighters most nuanced system was the result of a bug. The developers realised early that certain moves could be chained together, but felt that the skill necessary to pull off these manoeuvres would be too much for even seasoned players, so they were not quick to redo what was likely an immense amount of coding. Well, the rest is history, because players immediately took to the combo system and never looked back. In fact, it was not until Super Street Fighter 2 that these move strings were finally officially referred to as 'combos'. The combo's may have been unintentional, but the setting and character design was well thought out, and expertly executed. One thing that SF2 did better than anyone was creating a world of interesting characters. 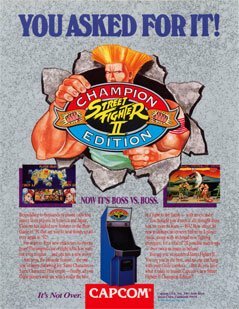 Many games up to this point were somewhat generic in terms of storylines and cast, but in Street Fighter 2, there are not only a pair of stars that carry the game (Ken and Ryu), there are also a multitude of other playable characters that are both engaging in terms of narrative and backstory, and a blast to play. SF2, arguably, has the best cast of fighters of any game in history. While the golden boys Ken and Ryu headline the show (in fact, they are the only two characters to be feature in EVERY single SF game made), all of the characters featured in the game turned into fan favourites. The "second tier" includes Guile, an American soldier with a wicked flat-top, Chun-Li the leggy martial arts expert from China, and Blanka, a mysterious green man from the jungle. Dhalsim, the long-limbed yoga master, E. Honda, a sumo wrestler and Zangief, a Soviet wrestler, round out the playable crew. If your skills are up to snuff, and you defeat all seven of your opponents in best of three matches, it is on to the boss fights. First up is Balrog, an African-American boxer modeled after Mike Tyson. Upon beating the fist of fury, you will then travel to Spain in order to fight the masked man, Vega. (Interesting Fact: Vega was an English Knight early in the development stage). If you are quick enough to beat the pretty boy, you are given the opportunity to fight the no-nonsense Sagat, a Muay Thai master who has a vendetta to settle against Ryu, who defeated and permanently scarred him in the first Street Fighter tournament. For those strong enough to take out the second in command, all that is left is M. Bison. This is no easy fight. As the leader of the criminal organisation Shadaloo, Bison harnesses a mysterious force known as "Psycho Power" which he uses often in the final battle. With the help of interesting characters and solid mechanics SF2 had raked in over a $1.5billion in revenue by 1993, and only a year later it was confirmed that the fighter had been played by at least 25 million Americans in homes and arcades. While other games talked the talk, Street Fighter walked it, with these massive numbers being a direct testament to the quality and influence this title has had on world culture. When it comes down to brass tacks, and we were forced to create a "King of the Arcade" rankings, it is almost certain that Street Fighter 2 would be very high, if not at the very top, of this distinguished list. Not only did it advance the arcade genre by leaps and bounds, it also created a mainstay in the gaming sector: the big budget fighting game. For those familiar with the early 90’s, it was the fighting game that reigned supreme, at SF2 was the catalyst which helped bring forth such iconic titles as Mortal Kombat, Killer Instinct, Samurai Showdown and King of Fighters, among many others. Being best in breed at the all-time height of the genre's popularity is something that no other title can claim, and it is for this that Street Fighter will always shine a bit brighter than the rest.